KUCHING: The Indonesian government has given its assurance that proactive measures are being taken for Malaysia and Singapore to prevent the trans-boundary haze. Speaking to reporters after witnessing the graduation ceremony of GiatMara at IKM Kuching yesterday, Minister of Environment and Natural Resources Dato Sri Wan Junaidi Tunku Jaafar said Johor was the only state (at press time) which recorded API reading of between 101-200 (unhealthy) yesterday. 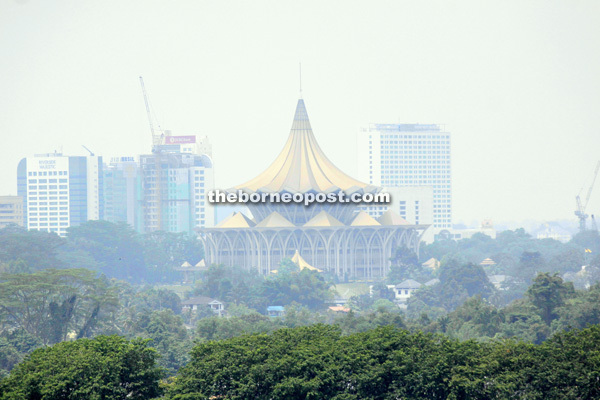 “Despite the hotspots in Sambas, West Kalimantan, it is fortunate that the trans-boundary haze has not reached Kuching and Kota Samarahan like what happened at this time last year,” said Wan Junaidi, who is Santubong MP. Other areas in Malaysia such as Negeri Sembilan, Melaka and Perak recorded readings of 51-100 while Terengganu, Kelantan, Perlis and Kedah recorded a healthy level (0 – 50). During the Asean ministerial meeting last month, the Indonesian government, had agreed to play a key role in eliminating transboundary haze by 2020. “If Indonesia has the right system and make amends to their current legislation to be more friendly towards the environment, I am optimistic the issue of haze and trans-boundary haze can be resolved,” he added. He said the current legislation in Indonesia was that landowners with plantations less than two acres had the right to conduct open burning for slash-and-burn clearing of their land. “This (legislation) seems to be the only challenge for Indonesia in tackling the hotpots in Sumatra and Kalimantan,” he added. On another note, Wan Junaidi said the environmental law and legislation in Malaysia were still sufficient at the state and national-levels due to proper control and a sound peat land management. “The only issue now is the absence of a law to give the authority the right to slap a compound on individuals found guilty of conducting open burning in their backyard,” he added. His ministry, he added, was at the final stage of drawing up such law to be presented to the Attorney-General and tabled in Parliament. “Once the law has been passed in parliament, an offender for backyard burning can be slapped with a compound of maybe RM2,000 while plantation operators conducting slash-and-burn will be slapped with a heavier compound up to RM500,000,” he added. the current law was rather obsolete.